THE EUROPEAN Microscopy Congress, EMC2012, held last month in Manchester, UK, was used by Agar Scientific to host two competitions related to microscopy imaging. The company supported the biennial International Micrograph Competition organised by the Royal Microscopical Society, which awarded a cash prize to Dr Rok Kostanjsek from the University of Ljubljana. 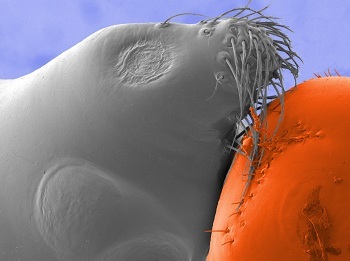 His image is a micrograph depicting the anterior part of the cephalothorax of money spider Walckenaeria cucullata (family Linyphiidae) under FE-SEM. Dr Kostanjsek explains that cuticular structures are a distinctive feature in male spiders of this genus. In the case of W cucullata, these protuberances and tufts of hairs closely resemble the head of a seal on large ball. The specimen was fixed in glutaradahyde, postfixed in osmium, dehydrated and coated in platinum before observation under Jeol JSM-7500F cold cathode FESEM. The colourised picture was taken at a working distance of 22.2mm and depicts area of approximately 270x225um. Agar also ran a photographic identification competition at the congress. Entrants were asked to study and name 20 colour enhanced micrographs, assisted by clues attached to each image. Two entrants managed to identify all of the images. The lucky winner, Dr Lucy Collinson, runs the electron microscopy suite at the London Research Institute of Cancer Research UK. She wins a Canon PowerShot S100 digital camera.